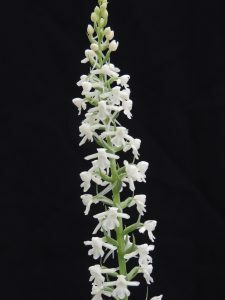 The first of our native species to flower in the temperate section of our greenhouse is the fragrant orchid – Gymnadenia conopsea. This species is present in nearby Wiltshire and Clay Hill is a great spot to enjoy the opportunity to lie down and admire its scent. Our seed raised native species grow in large pots in a mix of soil based and peat free compost with added limestone grit. 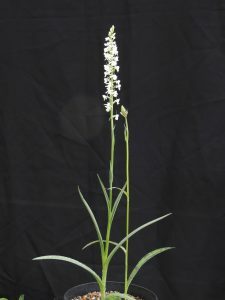 Gymnadenia conopsea is usually found in a range of pinks and purples but we are fortunate that this plant is a pure white alba clone. We will be collecting seed later in the summer to raise the next generation of native species. Is it Cley Hill NT near Warminster or Clay Hill Woods Wiltshire if we wanted to visit these beautiful orchids? Thank you. Thank you very much for the directions and plan.